According to reports, the junior student found the senior student, Brian Chu Ebai Ebenson, wearing his sports shorts. They both got into a fight when the junior student requested that the senior student return his shorts. After they were separated, other students rebuked the senior student for his attitude towards the junior student. The senior student then later approached the junior who was already in his bed to apologise. According to other students, the junior student misinterpreted the deceased’s approach for another attack, so he pulled a knife from his cutlery pack and stabbed him around his abdomen. Ebai Ebenson was taken straight to Mount Mary hospital but died befor he even arrived there. Eye-witness reports say that doctors and nurses at the Mount Mary hospital were stunned that Ebai Ebenson died from a small would with small loss of blood. Sasse students have told many visitors who went there to enquire about the incident that the death of Ebai Ebenson was the work of ‘satan the devil’. 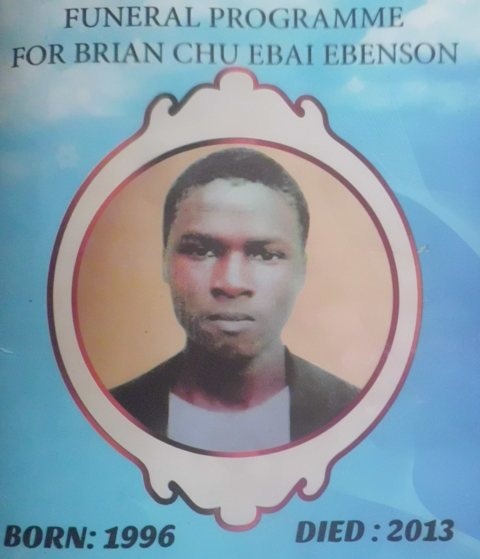 The deceased, Brian Chu Ebai Ebenson, and the form five student, were both of Manyu origin and had both lost their fathers earlier this year. This incident has left students in the school traumatised and the school authorities have offered mass for the repose of his soul.